St Robert was the youngest child of the nobles Géraud de Turlande and Raingarde at Auvergne, France. The family were related to Saint Gerald of Aurillac. St Robert was educated under the direction of the Church of St-Julien in Brioude. He was ordained a Priest in 1026 and later appointed Canon of St-Julien. St Robert founded a hospice for the poor in St-Julien and devoted much of his time to their care. 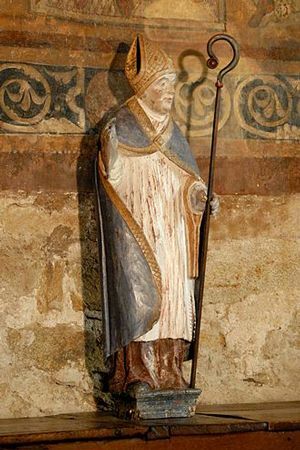 St Robert then moved to Cluny becoming a Monk under the direction of St Odilo. He later travelled to Rome and Monte Cassino to study the rule of St Benedict of Nursia and, with the knights Stephen Chaliers and Dalmas, he settled near Brioude, Auvergne. There he continued his work with the poor while constructing and restoring more than fifty Churches. In 1049, with by now more than 300 fellow monks, St Robert established an Abbey at Chaise-Dieu from which his community continued to serve the poor while living by the Order of St Benedict. St Robert’s Feast Day is 17th April, the day of his death and on which hundreds of miracles were reported. He is Patron Saint of Abbots, Hermits and Chaise-Dieu. Pray for us that we will use our time and skills wisely to tell others about Jesus.